I was mesmerized by a picture I say yesterday from a very beautiful working space. All white with a touch of color. It must be crazy amazing to have a space like that to work and receive people to work with. So I wanted to share this beautiful space. Love how the color in the space are from the flowers. I've featured this working space already on the blog, but I really love how the huge space is completely white and put together with some pop of colors. Great working space. 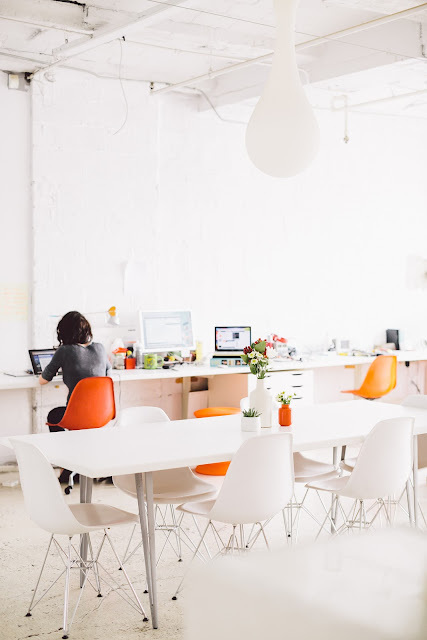 How about an all white working space with some pop of colors from flowers, furniture, decor? How do you like to put it together? Lets talk.